London, the National Art Gallery, from 27 February to 19 May 2013. The exhibition was presented previously at the Saint Louis Art Museum, from 21 October 2012 to 20 January 2013. The "Urbinate" : although this adjective refers to Raphael in the minds of many, it applies almost equally to Federico Barocci. Of these two Renaissance geniuses born in Urbino, the latter spent most of his life there after two stays in Rome which he left for the last time when he was 37 (true, the age at which Raphael died). We used the word genius on purpose. The exhibition in London confirms what many already knew : Barocci is a giant, a first class artist, as great a draughtsman as painter, and also one of the first "Baroque" exponents though his name has nothing to do with the term. Remarkable in its subject and the manner it enhances the works, as well as for its sound scholarship and excellent catalogue, the exhibition at the National Gallery is well worth a trip to London just for its own sake. Assembling this number of paintings was a daunting task. In many cases, they are large formats, fragile and difficult to transport. Instead of organizing a complete retrospective, the curators preferred to focus on the artist’s method of work reuniting fifteen of his most beautiful canvases next to their preparatory studies, thus reconstructing the "genetic files", to use the vocabulary and process employed by Eric Pagliano. With about 1500 paper works still preserved today , Barocci was one of the most prolific Renaissance draughtsmen. He used all of the techniques, from studies of details to sketches of the overall composition, multiplying above all sheets in color, either pastels or oil, and favoring, except at the very beginning of his career, studies of live models, systematically producing preparatory cartoons, at a reduced scale then execution size, some of which are preserved. The exhibition opens with a sole drawing, for his Saint Cecilia, as the painting produced for the Urbino cathedral did not make the trip to London. The work, his first, is different from what was to come : the painter drew his inspiration, via the engraving by Marcantonio Raimondi, from Raphael. 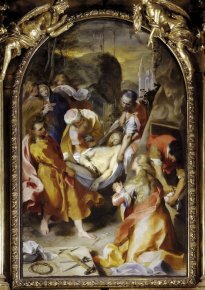 Obviously, his compatriot was sure to affect his work but Barocci soon broke free from his influence as demonstrated in Crucifixion with the Virgin and Saint John Evangelist (ill. 1) exhibited in the second room. Though certain very precocious paintings still show traces of Mannerisim (notably a very beautiful The Martyrdom of Saint Sebastian, also residing in the Urbino cathedral and reproduced in one of the introductory essays, this Crucifixion is the first altarpiece to escape the style completely. Indeed, we mentioned earlier that Barocci was one of the first Baroque painters. The statement is no doubt a bit exaggerated for an artist working essentially in the second half of the 16th century but the purpose is to underscore the fact that he was, just like the Carracci (whom he influenced) or even Caravaggio, the artist behind this new current. Furthermore, if one adds that, in this work and the preparatory drawings (ill. 2), Barocci shows his knowledge of Titian’s art (notably a Crucifixion held in Ancona) and also of Michelangelo’s (whose drawings he could very easily have studied in Rome in the early 1560’s), we can understand that his art is at the center of several tendencies, which however did not prevent him from creating a very personal style which, in turn, established a school. Another large altarpiece, yet another masterpiece : the Deposition which he painted for the Chapel of Saint Bernard in the Perugia cathedral, is also displayed here in London. Both the hang and the lighting in the retrospective allow visitors to see these church works in excellent conditions. While Perugia is often a must on sightseeing tours, the same is not true of Senigallia and its Chiesa della Croce where The Laying in the Tomb (ill. 3) comes from, is "one of the most extraordinary achievements in the artist’s career" as the authors of the entry write. Let us dwell for a moment on this canvas which is surrounded by many preparatory drawings. Barocci was known for painting slowly, the opposite of a "fa presto". We see why when looking at the countless sheets which allowed him to finally complete, after considerable effort, the definitive composition. The London exhibition thus displays several studies for the dead Christ, studies of draperies, others showing legs or arms... Barocci searched thoroughly for the best composition, hesitating on a direction, alternating studies of ensembles roughly sketched in ink (ill. 4) and studies in white or black chalk, with heightened pastel which are one of his signatures. We can also see, several studies of heads (ill. 5 and 6) side by side, some in the above technique, others in oil on paper. Finally, the artist produced several studies which are very close to the completed work, in black chalk and charcoal, or in oil. Some of his overall studies are done in camayeu, as is the case here for the work entitled Il Perdono (ill. 7) where we see Saint Francis of Assissi kneeling in a church in front of an apparition of Christ, the Virgin and Saint Clare . One of the preparatory drawings for the legs and feet of Christ (ill. 8) is, in our opinion, one of the most beautiful by the artist (and even in Italian art). The vibrant stroke shows how Barocci searched for the best possible solution for his final work while at the same time taking care in achieving the needed balance in the drawing itself. We might, in fact, dwell further on each of the paintings and drawings in this exhibition, given the level of quality throughout. However, we will simply point out the presence of a very large format, The Last Supper from the chapel of the Santissimo Sacramento in the Urbino cathedral, of his only non-religious painting (ill. 9), of several remarkable landscape drawings (ill. 10), a lesser known aspect of his oeuvre, as well as several portraits. Barocci, who returned to Urbino rather quickly due to a probable poisoning by jealous fellow artists (this theory has not been proven however), apparently suffered from poor health his whole life, perhaps explaining the fact that he worked so slowly. Nevertheless, we might find ourselves a bit skeptical at just how serious these problems really were since he lived to a ripe old age. While some of his late paintings were produced mostly by his studio, Barocci, who above all designed the compositions, continued to renew his inspiration, notably by introducing nocturnal atmospheres into his paintings. The last one shown in the exhibition, painted between 1603 and 1609 for the Aldobrandini chapel in the church of Santa Maria Sopra Minerva (his only papal commission), proves that he was in full possession of his artistic skills. 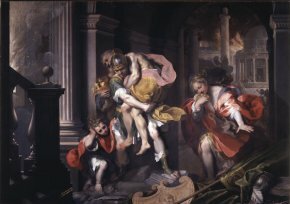 Barocci was great at every single moment of his long career. Curators : Judith W. Mann and Babeth Bohn. Judith W. Mann, Babeth Boh, Carole Plassotta Federico Barocci : Renaissance Master of Color and Line, Yale University Press, 2012, 376 p., £45. ISBN : 9780300174779. Visitor information : The National Gallery, Trafalgar Square, London WC2N 5DN. Tel : +44 (0) 20 7747 2885. Open every day from 10 am to 6 pm, Fridays until 9 pm. To make reservations or buy tickets, see the National Gallery website. The number quoted in the catalogue, although some specialists acknowledge up to 2000. This is an acknowledged replica, rather than a study, from a large altarpiece residing in the church of San Francesco in Urbino, where Saint Clare is replaced by Saint Nicolas de Bari.